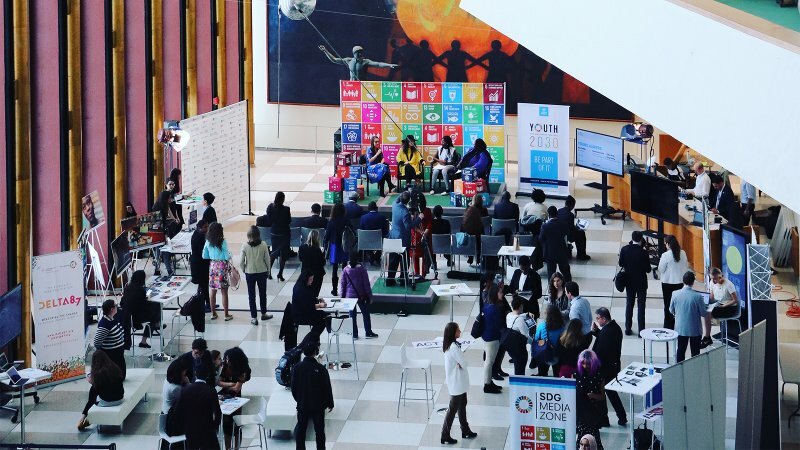 The Economic and Social Council (ECOSOC) Youth Forum, held on 8-9 April 2019 at UN Headquarters in New York, offers a unique opportunity for youth to voice their opinions, share ideas, and think together about what they can do to achieve sustainable development. Held on the sidelines of the Forum, the SDG Media Zone engages influencers, innovators and youth leaders in lively discussions on how young people are actively working to achieve the Sustainable Development Goals. Watch the exciting panels from Day 2 below and check out more content from previous Media Zones on un.org/sdgmediazone. To read the wrap-up of Day 1, click here. Panel 1: Art Walk for Decent Work! What does art have to do with the Sustainable Development Goals? Visual Artist and Social Activist Shalak Attack uses her art to reflect on her identity, her mind, and her voice for tackling South African and global issues that concern her including education and gender equality. Faith, who also works with public murals, tells stories about humanity through her colorful art that focuses on social partners, green economy, and gender equality. For Fatoumata Cisse, a 14-year-old student from a high school in South Bronx, climate change education and coming up with ideas to build a more sustainable high school need to be prioritized. Educating youth means having better leaders in the future. Callie Anne King-Guffey, who works for UNICEF, has a similar approach stating that the SDGs are about the future, and who cares more about the future than youth? According to Thibault Chareton, UNAOC Project Management Specialist, hate cannot fight hate. Chareton argued that the rohingya refuges need to be given opportunities to access education in Bangladeshi camps, which is a fundamental human right. Rahma Gamil Soliman, IOM Migration Officer, talked about the importance of being objective, listening to people, finding out where they come from and not judging people before knowing them, and educating citizens on the benefits of refuges for society. Lovell Corporation is a platform to bring people together, empower young people and give the same opportunities to youth around the world. Its CEO, Kelly Lovell, wants to connect people who have new ideas, increase political action, improve local communities, invest in young people who wish for a better future, and create opportunities for all. Can the fashion industry be sustainable? Business and sustainability don´t usually come together but H&M, as its Media Relations Patrick Shaner explains, is changing this idea. Thania Peck, Creative Director of Catcher in the Style, shows how we can help the environment and oceans and still look fashionable, proving that no act is too small. If we all are more involved, together we can change the world. The Born This Way foundation helps to empower young people who have a mental illness. People don´t know what to do when they are not mentally well, says Colleen Werner, Reporter of Channel Kindness, and stigma sometimes doesn’t let people reach out. Ify Ufele, Founder of Bully Chasers, shares her clothing line that inspires others that relate to her story, stating that if you look good, you feel good. No act is a small act. There are numerous ways of improving the environment, and we must act today. Tolu Olubunmi, Campaign Manager from the Department of Global Communications from the UN, explains how the new Facebook Messenger program ActNOW.bot can help people address climate change by taking small actions, share it with friends, and start improving the world. Millennium Fellows Shantel Marekera, Claire Sliney (also Executive Producer of Period. End of Sentence) and Jason Dietrich explain what their dreams are, what their future looks like, and how they found their way to change lives and empower people. They all defined education as the most important means to creating change and believe that youth need to demand a seat at the table, not waiting for someone to give opportunities. How can music and film help reach the SDGs? Aicha Cherif combine her two passions as filmmaker and activist to change lives, impact individuals and improve the world. She shares her concerns about the future and her dreams with Ari Afsar, an Artist and Activist who uses her art as a way to spread positive messages and imagine the world she wants to live in.